For $149.90 per pax, you get a 3D2N Standard Chalet Stay with Breakfast, 2 Way Ferry and 2 Way Coach Transfer (worth $265). For $219.90 per pax, you get the above with Additional 60 minute massage and 2 dinners (worth $355). 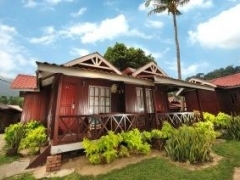 Paya Beach Spa & Dive Resort, a traditional-styled hotel that lines the beaches of Tioman Island, is a welcoming oasis for merry makers seeking a bit of peace and tranquility away from stresses of the city's bustle and overbearing bosses. Indulge yourself and take advantage of the hotel's numerous facilities, including bars, restaurants, a swimming pool, and even a diving centre where adventure seekers can enjoy a fully experiential session of diving. Boasting a beach bar and sun deck, Paya Beach Spa & Dive Resort is stacked with facilities for anyone looking for a vacation filled with fun activities or contemplative relaxation. Reviews It is a nice place to spend time with our family, especially our whole family loves the sea very much. At Paya Beach Resort, we found life is so relax, enjoyable and time actually pass very fast. FYI,this was our fifth year staying in Paya Beach Resort and the staff of Paya are very friendly and helpful and yes, the food taste delicious."